[April 29, 2016] – The first full week of May is annually recognized as National Travel and Tourism Week, a tradition first celebrated in 1984, established by a Congressional joint resolution passed in 1983. Travel and tourism is one of America’s largest industries generating $2.1 trillion in economic output in 2015, with $947.1 billion spent directly by domestic and international travelers that spurred and additional $1.2 trillion in other industries. Tourism directly generated $147.9 billion in tax revenue for local, state and federal governments. Direct spending by resident and international travelers in the U.S. averaged $2.5 billion a day. Each U.S. household would pay $1,192 MORE IN TAXES without the tax revenue generated by the travel industry. In Baldwin County, tourist spending generated $83 million in direct tourist spending and produced $15.6 million in worker income and paychecks in 2014. As a result of taxes generated by tourist activity in Baldwin County, each household pays $342 less in local and state taxes. “Travel and tourism is one of the most reliable generators of jobs at all levels of the American economy, including right here in Milledgeville and Baldwin County. We aim to show the powerful role of travel in this community,” says Linda Bailey, Office Manager of the Milledgeville Convention & Visitors Bureau. National Travel and Tourism Week is May 2nd- 7th — this week of events serves to champion the power of our industry. 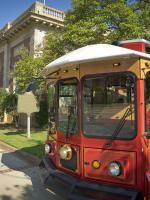 Our goal is to ensure that visitors have a great experience and give a positive impact while visiting our community and to do that; the CVB is offering FREE trolley tours with an additional tour on Wednesday at 2pm to the public. 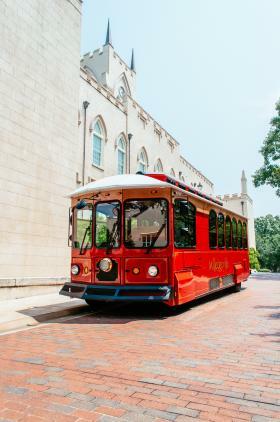 The Old Governors’ Mansion, Old Capital Museum, Rose Hill, Sally Ellis Davis house, John Marlor Art Center, Andalusia, and the GCSU’s Natural History Museum will be open to the public and offer FREE admission on Wednesday May the 4th in honor of National tourism week. The tours are first come, first serve.